“Gangsta’s Paradise” rapper Coolio gave an awesome performance of his hit song at the inaugural AP Music Awards, alongside Falling In Reverse and Issues' Tyler Carter. When the rapper wasn’t lying down verses with Ronnie Radke, he took some time to show off his skills as a conductor. 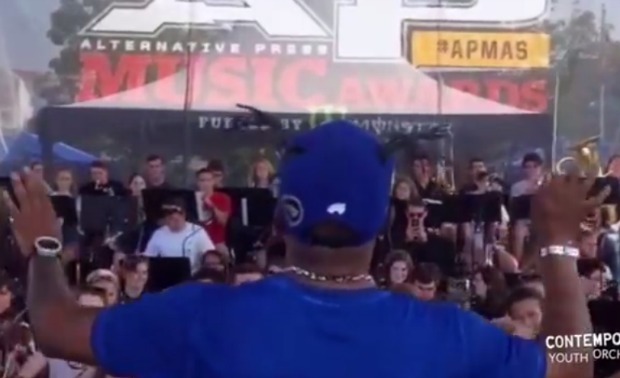 Below, you can watch video of Coolio conducting the Contemporary Youth Orchestra. Check it out, and let us know what you think. Also, if you missed it, watch Coolio’s performance at the APMAs with Falling In Reverse and Issues singer Tyler Carter.